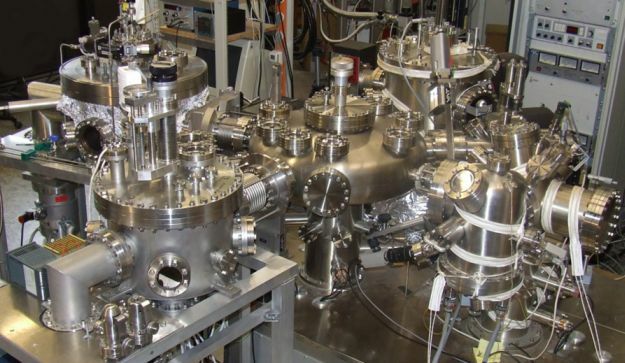 For the preparation and analysis of epitaxial thin films of complex materials a UHV-cluster consisting of one molecular beam epitaxy (MBE) chamber, two sputter deposition chambers and two analysis chambers is used. The samples are deposited by e-beam evaporation, effusion cell evaporation, dc- and rf-sputtering. As analysis tools electron diffraction (RHEED, LEED), scanning tunneling microscopy (STM) and UV-photoemission spectroscopy (UPS) with spin detection are available.